Bert Kreischer first became known as The Machine when he was in college. Now, the comedian has also been crowned the Tour Bus Champ after his recent Body Shots Tour across North America. We talked with Bert to learn more about his bus, what he loves about life on the road, and how his coach reigns supreme over the bus owned by his friend, fellow comedian, and “Tour Bus Chump” Tom Segura. 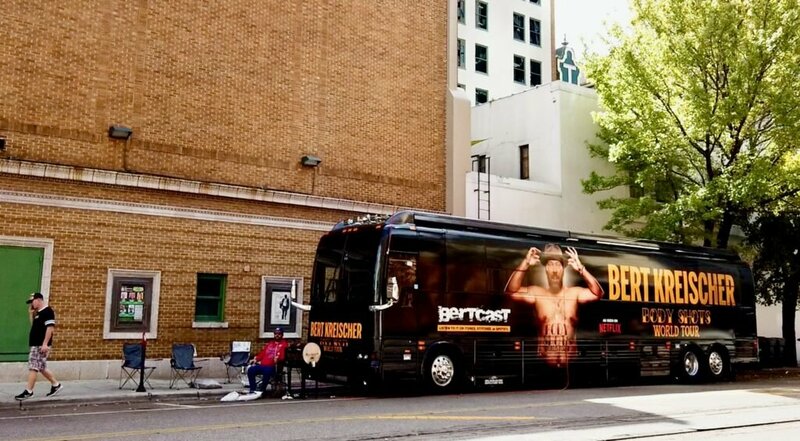 The Prevost, newly leased for Bert’s Body Shots Tour, was wrapped with exterior graphics that also promote his podcast and new Netflix special. The Body Shots Tour, which kicked off in January 2019, is the first tour he has done by bus and now he wouldn’t want to have it any other way. The tour bus is like having a home on location everywhere he performs. All of his shoes, sweatpants, medicine, and personal items are right there with him on the bus. His wife stocked the bus when they first hit the road and he has since accumulated a variety of rep merchandise while traveling. One of Bert’s favorite additions to the bus is his REC TEC travel smoker. It’s been used to cook pulled pork, beef ribs, and even veggie burgers. 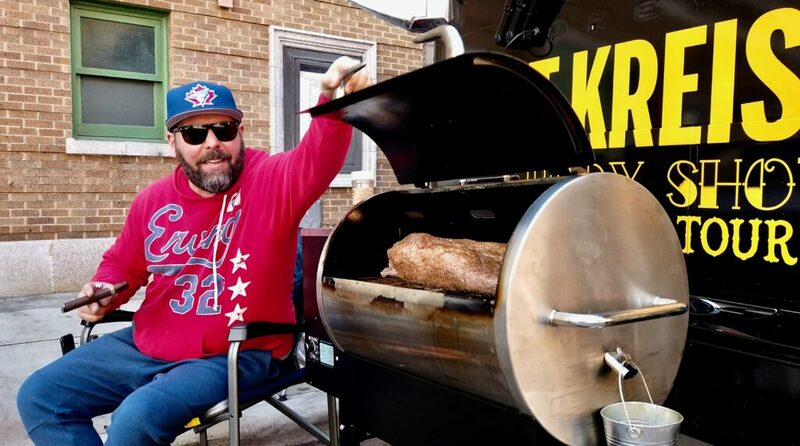 He recalled a time when he pulled out the smoker in downtown Tampa, cooked a 15-lb brisket with friends, and the local police recognized him as The Machine. 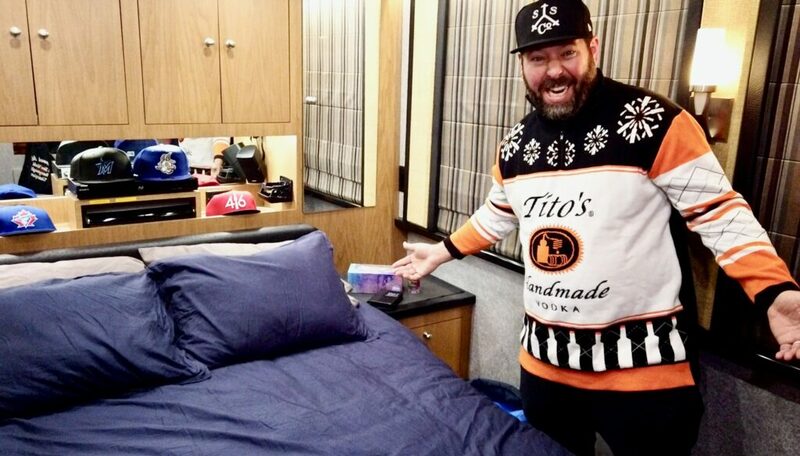 Bert says he has gotten some of the best sleep in his life on the bus. The bed has a Tempur-Pedic mattress with heavy, cozy sheets. On a trip from Seattle to Calgary, he slept like “a bear hibernating” for almost 14 hours straight. He also has great memories of traveling with his wife through the Canadian Rockies near Banff National Park. The comic recalled looking for a rest area, opening the bus door and being overwhelmed by the views of the snowy mountains. Another time, after hearing that Niagara Falls was frozen over, his bus was on the road by 7AM the next morning to New York. He remembers having chicken wings and cocktails and getting photos of the frozen waterfall in 2-degree weather. The most memorable place that he’s visited on tour, most surprisingly, was when he visited Indianapolis in the middle of a blizzard. He loved the quaint small town feel, he could comfortably watch the Rams in the NFC championship, they had the slides out on the bus and a fantastic venue. His next show will be this March in Washington, DC, then he’ll continue through New Jersey, Philadelphia, Salt Lake City, Denver, Green Bay, Milwaukee, and wrap up in the US in Minneapolis. After that, he’ll be flying out to perform shows across Europe and Scandinavia. Bert gives the full tour of his bus in the video below. You can also learn more about his upcoming tour dates and get tickets on his website BertBertBert.com. If he loves that bus, then why not keep it and have it re wrapped? Just sayin…you know, unless you have money to burn.